With the release of Internet Explorer 8, Microsoft enhance IE surfing capability to new height. Its safer, better and it’s free to update for entire Microsoft community. Accelerators: The new Accelerators in Internet Explorer 8 help users quickly perform your everyday browsing tasks without navigating to other websites to get things done. Simply highlight text from any webpage, and then click on the blue Accelerator icon that appears above your selection to obtain driving directions, translate and define words, email content to others, search with ease, and more. InPrivate Browsing: Searching jobs at work or doing something different before wife yale on you. Its easy now. Just open IE8>Safety>Inprivate browsing. Don’t forget to close it once finish. All cookies, history will automatically be deleted. So no trace of cheating. Web Slices: Web slice is nothing but a slice of web added into browser. Keeping you up-to-date with sports, weather etc. Using Web Slices, you can keep up with frequently updated sites directly from the new Favorites Bar. If a Web Slice is available on a page, a green Web Slices icon will appear in the upper-right hand corner of the browser. Click on this icon to easily subscribe and add the Web Slices to the Favorites Bar so you can keep track of that “slice” of the web. Filter and Web Check: IE8 checks every website whether it is genuine and safe or not. Open IE8>Tools>SmartScreen Filter>Check this web site. If you turn on automatic check it will check itself. 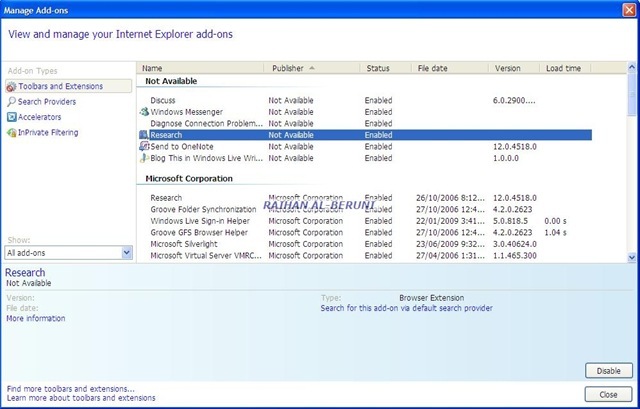 Malware detection software will download and install while downloading IE8. It protect you from malware, phishing websites and unsafe web sites. IE8 can check digital certificate i.e. whether specific web site got credible digital signature from VeriSign, e-trust etc.